His father, Thomas Jackson Foggitt (1810 - 1885), was a Drugist of Yarm and also a known botanist, having made a contribution to various "floras" (Desmond 1977). William married Elizabeth Thompson Blackett in 1857 and raised a large family, several of his sons following the profession of Druggist and Chemist. 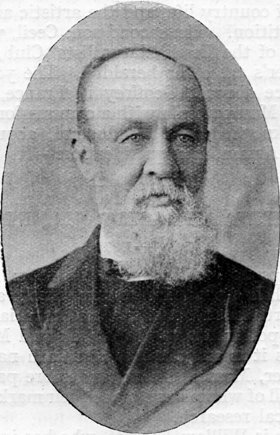 His eldest son, also a Thomas Jackson Foggitt, was an active botanist who, in the final years of his life, along with his new wife Gertrude Bacon, acted as treasurer of the Botanical Exchange Club. Of his other sons, Gilbert Baker Foggitt (1867 - 1943) emigrated to Australia in 1886 and John Blackett Foggitt (1861 - 1942) has specimens in various herbaria. Likeness (left) from his Obituary notice in the Naturalist 1917. 1835 February 2 : Birth William, son of Thomas Jackson Foggitt and his wife Elizabeth née Dale baptised at Thirsk 1835 February 17. Date of birth from Desmond 1977. MARRIAGES. - MISCELLANEOUS. On Tuesday, at the Wesleyan Chapel, Thirsk, by the Rev. W. Lindley, Mr. William Foggitt, chemist and druggist, to Elizabeth, second daughter of Mr. John Blackett, currier, all of Thirsk. Botanical Exchange Club Appointed curator of the Botanical Exchange Club; a post he held for one year. The funeral, which was one of the largest which has taken place in the town for some years, took place at Thirsk yesterday of Mrs. Wm. Foggitt, wife of Mr. Wm. Foggitt, J.P., who died on Sunday, at the age of 65. Mr William Foggitt of South Villa, Thirsk, was roused [by] a crackling sound, and on going downstairs he found the dining-room on fire. He awakened the other inmates, and with the help of neighbours they succeeded in extinguishing the flames. The damage ammounted to between £100 and £150. OBITUARY. A THIRSK CHEMIST & BOTANIST. The death occurred at Sooth Villa, Thirsk, yesterday, of Mr William Foggitt, F.L.S., at the age of 83 years. When a comparatively young man deceased succeeded his father as a family and dispensing chemist and druggist, and also carried on an extensive wholesale trade. He early contracted a love for natural history, and has made the study of botany and the collection plants and flowers a life-long recreation. In 1903 had the honour of being elected a Fellow of the Linnæan Society. In politics he was staunch Conservative, fearless in advocating his views, and in religion was a prominent member the Wesleyan Methodist Church, holding a number of offices in connection with that body. He was a widower, and leaves surviving him five sons and three daughters. Mr Foggitt was Justice of the Peace. As would be expected of a member of an exchange club, his specimens are widely distributed in herbaria throughout the country. The link tabulates those documented by the "Herbaria at Home" project.